Tonight's episode of Agents of SHIELD brought abut a huge change to the underlying story line. And this change had been in the works since the show started, but they could not let on until tonight, that events in this episode were going to be tied into the newest Captain America film, The Winter Soldier. But the showrunners said they had to bide their time and plot out a story until the release of Captain America The Winter Soldier, and in so doing, did indeed, lay some interesting nuggets throughout the season, up until now. Barring the horrible writing at times, the questionable effects, and the sadly overly-abundant dropped hints at Coulson's condition, up until his reveal, some of the clues and nuggets, looking back, makes the show more interesting. 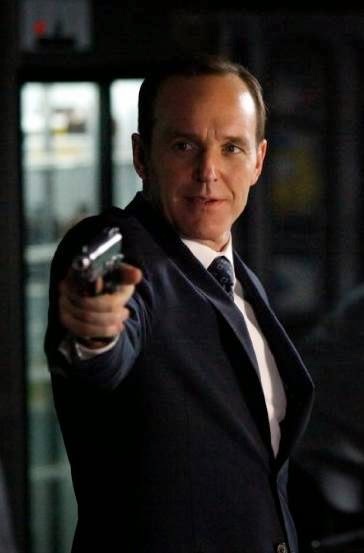 Last week Coulson (Clark Gregg) was holding a gun on May (Ming-Na Wen), after she just tried shooting Fitz in the head. But as tonight's episode evolved, we watched a pissed off Coulson take action, we learned that May was using a direct line to Col. Fury (Samuel L. Jackson), and that Hydra has fully infiltrated SHIELD. And we were first led to believe that Victoria Hand (Saffron Burrows) was the head Hydra infiltrator. But watching the show, we saw the twists and developments that kept us on our toes, and that was a refreshing experience with AoS. Hand turns out to NOT be HYDRA, and that Agent John Garrett (Bill Paxton), despite the apparent threats to his life by a HYDRA attack, is in fact, the big HYDRA infiltrator and the info leak from SHIELD, or, the Clairvoyant. And throughout the episode, we have been told that Col. Fury is dead, folks are led to believe that Coulson is HYDRA, and when the episode winds down, Coulson defeats Garrett, and Hand and Coulson are the only ranking SHIELD agents left in the organization. We learn about a few safe spots that SHIELD still has and Hand is taking Garrett to a holding cell. But then we see the biggest twist of all. Hand asks Agent Ward (Brett Dalton) to shoot Garrett. But then Ward shoots the guards and Hand to death, and the big reveal just took place. And in an interview with TV Guide, the showrunners drop little hints of what had taken place through the season, to the dropped nuggets to Ward's infiltration. HYDRA infiltrates by getting and building trust of its victims. Future episodes of AoS will also be delving into Ward's association with Garrett, his family, his past, and how he feels with our team. And those nuggets through the season? He took on his biggest threat and seduced May [Ming-Na Wen]. He sidled up to the unknown, and became her training officer. Skye [Chloe Bennet]. How do you build team trust? By diving out of an airplane to save Simmons [Elizabeth Henstridge]. But he did have a parachute, so he was at no real risk. So we thought we got to know Ward, and all along, (From the beginning for the showrunners), Ward was working over his team, and fooling the TV viewing audience. Despite the HYDRA threat finally coming to light, Coulson's team still has other issues to clean up or deal with. There were some spoilers for the Cap movie, but then again, were they? Will we be seeing Samuel L. Jackson again? Some already know that answer, and since you've trudged on past the SPOILERS warning, then do know that we'll see him in the season finale of Agents of SHIELD. I don't know in what capacity, if he's dead, it will be a ghost. If he's not dead, maybe the infamously underused LMD plot will come to light. EH, we'll find out then. This was a fun episode. And it was great to see a TV episode touch base with a movie that's in theaters. But will the series be able to keep this energy and maintain its own identity? Or will it return to the story of the week and continue to lose viewers. I have to say, I like the connection of the show to the Marvel Cinematic Universe, but there aren't enough movies to keep the show that fun throughout. SO they have to crank it out and give the show more of a decent amount of momentum.